Spread offenses are often known for being passive and based solely on finesse. 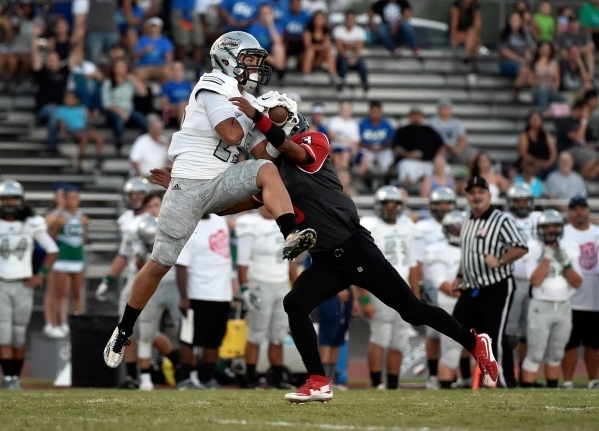 Green Valley proved that stereotype wrong Friday night. 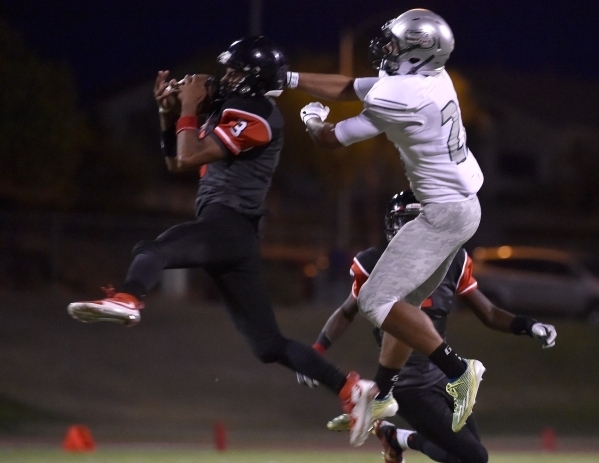 The Gators pounded the ball from the spread, rushing for 327 yards and holding on for a 38-34 win at Las Vegas High. Spread offenses are often known for being passive and based solely on finesse. 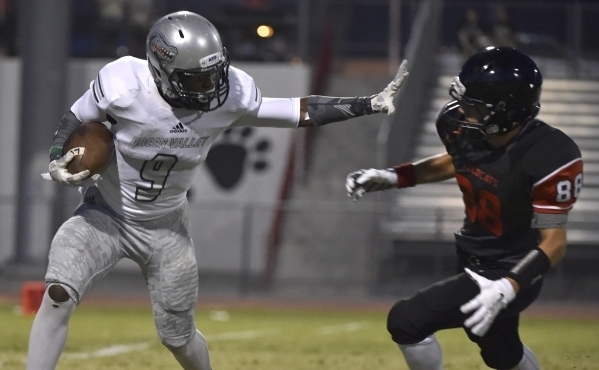 Green Valley proved that stereotype wrong Friday night. 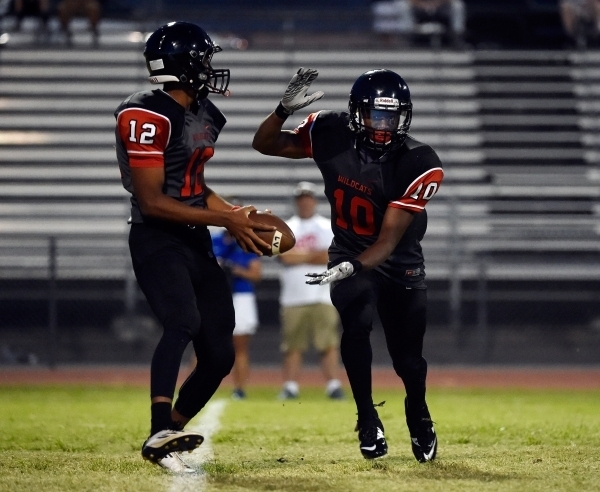 The Gators pounded the ball from the spread, rushing for 327 yards and holding on for a 38-34 win at Las Vegas High. “We were the hammer and not the nail this time,” said senior running back Austin Warhop. After Las Vegas scored with one second to go in the first half on a 19-yard touchdown pass from Ronnie Broadbent to Raul Perez to tie the game at 21, the eighth-ranked Gators (1-1) came out and pounded the ball with Warhop. Green Valley gave Warhop the ball on the first six plays of the second half. In all they drove 57 yards on 10 plays, only one of them a run. Warhop capped the drive with a 3-yard TD run to make it 28-21, and the Gators wouldn’t trail again. Green Valley ran for 189 yards in the second half and finished with 487 yards of offense. The Gators took advantage of a Las Vegas miscue on the next possession when Broadhead tried to throw a bubble screen to Nicholas Sablan. The ball was thrown behind him, and it went off his hand. It was ruled a lateral, and Drake Maningo recovered for Green Valley at the Las Vegas 43. Three plays later Warhop danced through the Las Vegas defense, first going right, then left to score on a 29-yard run to make it 35-21 with 5:37 to go in the third quarter. 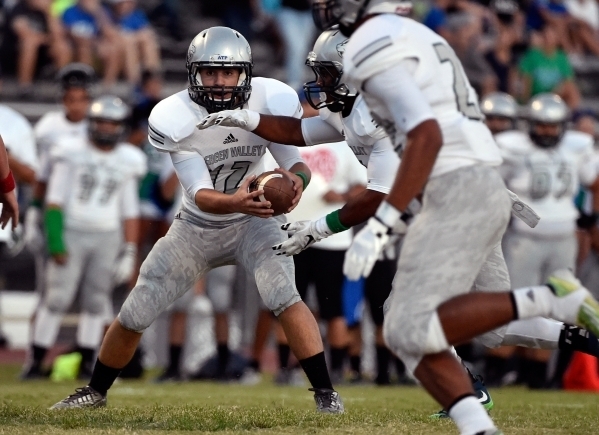 In all, Green Valley forced five turnovers, forcing three fumbles and intercepting two passes. One of the interceptions was a highlight-worthy catch by Tyeree Johnson. Johnson deflected the pass near the left sideline. As he fell to the ground, the ball bounced off his foot and into the air and came down into his hands. The Gators turned the turnovers into 17 points to help them hold off the Wildcats (0-1). The game seemed to be sealed after Spencer Cofer’s 19-yard field goal made it 38-21 with 8:24 to play, but Las Vegas wasn’t done. Broadhead found running back Elijah Hicks streaking down the middle for a 48-yard TD pass with 4:09 to go that made it 38-28. After Green Valley turned the ball over on downs, Las Vegas drove 70 yards on six plays with Broadhead scoring on a 1-yard run. 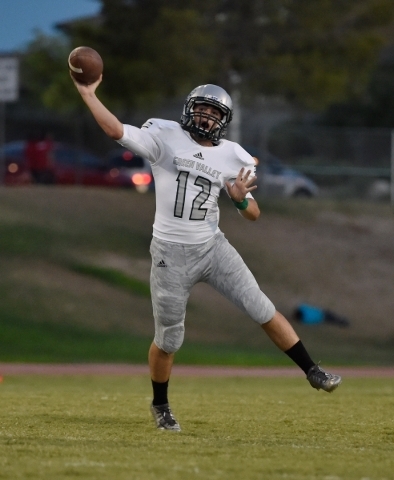 The extra point was blocked, and Green Valley held on to a 38-34 lead. But the outcome wasn’t secure until Nahzi Salih’s 7-yard run picked up a first down with 25 seconds to go, and the Gators were able to run out the clock. Salih finished with 92 yards on 17 carries, and A.J. Amelburu completed 15 of 22 passes for 146 yards and two scores for Green Valley. Broadhead completed 15 of 21 passes for 275 yards and three scores, and Hicks rushed for 112 yards on 18 carries to lead the Wildcats.